For one serving, add two scoops of powder ( 60 g) to 300 ml of water, shake to blend and enjoy! BioMax Whey True Protein (53%) (whey protein concentrate (milk), whey protein isolate (milk), hydrolysed whey protein (milk)), Lglutamine, maltodextrin , creatine monohydrate, cocoa powder ( 6 %), soya oil powder, calcium betahydroxybetamethylbutyrate, medium chain triglycerides , flavourings , sweeteners (sucralose , acesulfame K), thickener (cellulose gum), zinc oxide. 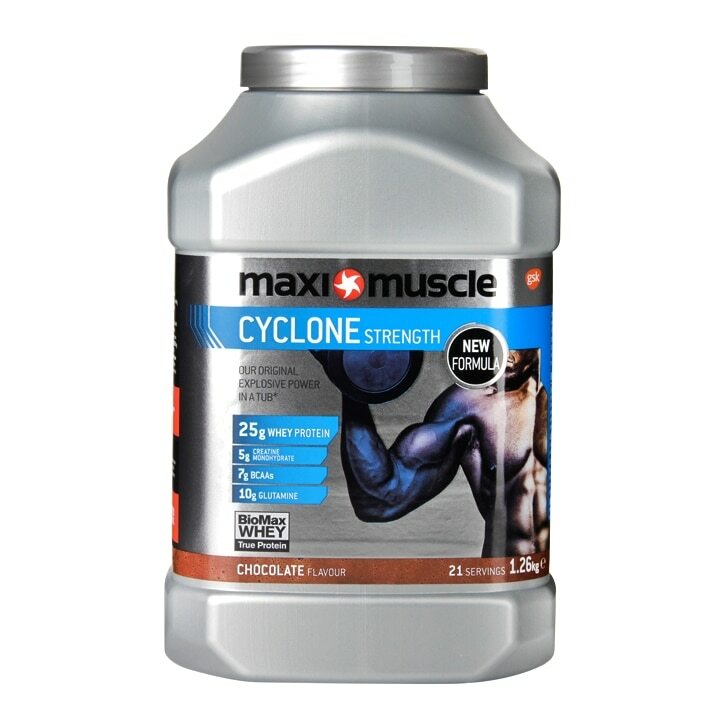 MaxiMuscle Cyclone Powder Chocolate is rated 4.0 out of 5 by 5. Rated 5 out of 5 by Stevie C70 from Great protein powder Bought this in the half price promotions and ended up buying more. Taste is lovely and really give me energy during my gym workout and does what it states. Thoroughly recommended. Rated 5 out of 5 by Bazzz from True gains This product does what it stated on the tin. I jump on this every year for 3-4 months prior to holidays to get back in shape. If your training hard and it really does help shape. By no means the cheapest but for me... the best (and I’ve tried a few) Obviously it must be used with a decent diet but true mass gains are achieved. Rated 3 out of 5 by Tiredofwritingreviews from Used to be terrific... Judging by the taste the formula has been 'improved'. Before this used to be there best tasting on the market. Now, it is just like many others - pretty awful. However, on the upside, I feel confident that the efficacy is just as good as always.